Conceptually, The Planetary Meditation for Peace is based on The Prayer of St. Francis of Assisi. According to our Spiritual Teacher - the Meaning of this Prayer - can be understood more deeply - through Contemplating the Phrases of the Prayer. 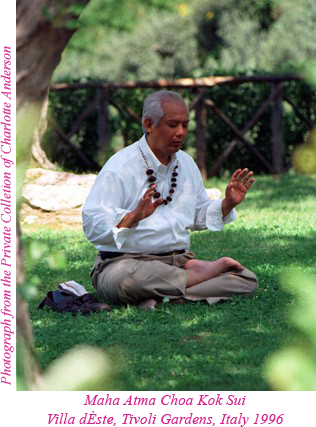 He taught us that this line of the Prayer brings Divine Energy down from the Spiritual World into the Physical World. The Quantity & Quality of that Energy activates the Love within you. It is this Great Love - that Heals our Inner Anger & Hatred our Sorrow & Suffering. This means that we are in a Position to Forgive because it is through Forgiving others that we are Forgiven! This means – when we understand The Law of Karma – that we may Experience that “What we give is what we Receive”. So we must Practice Forgiveness & Learn to Forgive Others. This means that Internally we will not become Disturbed or Ruffled – because we have moved to a “Higher Station” to a more Accurate Level of Perception - therefore we are Less affected by formerly Disturbing Experiences & Events - because both our Internal & External Reactions become more Regulated. This means that in difficult Situations we may remain Filled with Great Inner Peace. We are able to Recognize the Transformational Quality of Divine Light – as it Uplifts those who are Blessed. We can See the Result of our Positive Actions & this Infuses us with Confidence – Ultimately Sustaining & Filling us with Great Inner Joy. This means that eventually – we may reach a place where Earthly Events - No Longer affect our Equanimity – & Gradually, Our Inner Joy becomes One with Divine Joy – which is without Beginning & without End. This Means that once again the Meditator realizes the Exactness of The Law of Karma. When one Consoles Others – then the Meditator becomes Filled with Divine Light, Divine Love & Divine Power. The Magnification of these Divine Qualities within the Meditator reduces their Personal Inner Pain which is rapidly Consoled through the Action of their Consoling others. instead of Sinking into our own patterns of Negative Thinking - which are the Root Causes of our own Inner Pain & Selfish Misery - we may Develop Inner Peace & Self Control. This means that when you Forgive you may Forget and let Go and Keep on Living! This translates into the Personality becoming more Balanced which leads us to the Evolution of the Soul and explains Eternal Life.